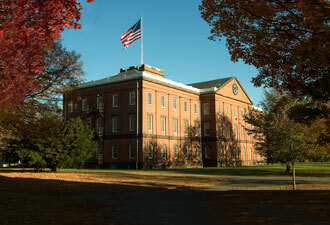 Steeped in history and full of surprises, Springfield Armory awaits your visit. George Washington established the nation's first federal armory high above the banks of the Connecticut River. Military shoulder weapons were manufactured here from 1794 to 1968. First to greet you inside the Main Arsenal building is the great spiral staircase. Many visitors have pondered why the staircase was designed in a spiral. Do you think it looks like the rifling in a barrel? 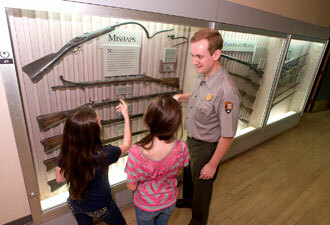 In the museum, staff will lay out your opportunities for fun and exploration. Shall it be a museum search to become a junior ranger? Watch the 15-minute orientation film. It consolidates 174 years of manufacturing and sets the stage for a quality visit. After this introduction, be sure to check out the three cases of Civil War firearms on the other side of the theatre wall. Here the expression, “If these guns could talk…” really does speak true. Note the details of soldiers' weapons, with their battle-damaged barrels and heartfelt messages carved into stocks. Imagine what it was like to have fought in so many battles. Did these men survive the war? Venture through the museum exhibits, first on the Industry side, taking you back to the 18th century when firearms were made by hand. Armory technological innovations advanced to mass production, introducing the process of creating totally interchangeable firearms that led to consumer products of today such as automobiles, baseball bats, and furniture. As you approach the Weapons side of the museum, you'll see one of the icons of the Armory—the “Organ of Muskets.” The famous poet, Henry Wadsworth Longfellow, visited Springfield Armory in 1843 with Mrs. Longfellow, who commented that the racks of muskets reminded her of a church organ but instead played the music of death. 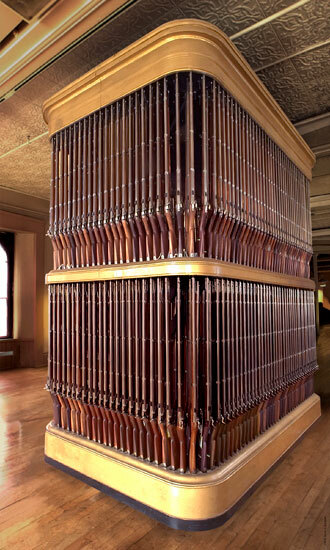 Inspired, Longfellow wrote the famous peace poem, titled “The Arsenal at Springfield.“ Visitors from around the world stop and photograph this last standing gun rack, rich in armory history. Get outdoors, and enjoy a walking tour of the historic Hill Shops and see how the Springfield Technical Community College makes use of these historic buildings. Every summer the park hosts a number of special events, pulling out all the stops on Armory Day with many free outdoor and indoor activities, including blank firing demonstrations that bring to life the sights and sounds of Civil War firearms and share a taste of the realities of war for both soldiers and civilians. In July, you won't want to miss the Big Band concert, with several military bands honoring the armory's deep-rooted connection to the military and commemorating the 1943 Benny Goodman performance at the armory. Located in Springfield, Massachusetts, within 1.5 hours of Boston and Albany, New York, and just 30 minutes from Hartford, Connecticut, Springfield Armory National Historic Site makes a great day or weekend trip. Come visit!